At the "Ningen Shogi" of this year, there were some new directions, one of that thing is a set of an event place. 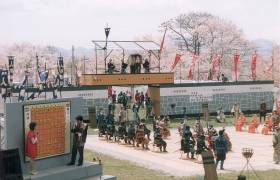 They struck the "Oushou Daiko"(Janapese drums), which whenever a shogi piece worked, on the special stage next to the large shogi board. But this year, they had a entrance gate of samurai, they played the "Oushou Daiko" on the special stage on the gate. And from this year, samurai didn't bring shogi pieces. Some tourists may appeal that they didn't understand a movement of shogi piece. 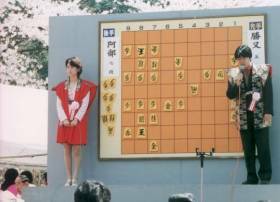 But they can see it at the big board which professional shogi players comment on, and it is more beautiful that they act without shogi pieces. 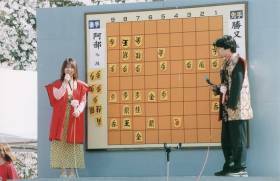 During the game, they comment on the way of battle near a large shogi board. On the 1st day, professional shogi player become a commentator who play on the 2nd day, on the 2nd day, professional shogi player of higher class come to Tendo as a commentator. This year Mr.Takeshi FUJII with the title "Ryuou", Ms.Yamato TAKAHASHI and Ms.Sayuri HONDA commented on. Previous "Tourists" <Please choose...> Next "Japanese Drums"